SharpCap’s experimental collimation tool is designed to help spot collimation problems on Newtonian telescopes by measuring star size across the field of view. If you take images of a well-focussed star field with little nebulosity then in a correctly collimated Newtonian telescope the sharpest stars should be in the centre of the frame while stars towards the edges and particularly in the corners will be larger due to the effects of coma and (potentially) other aberrations. 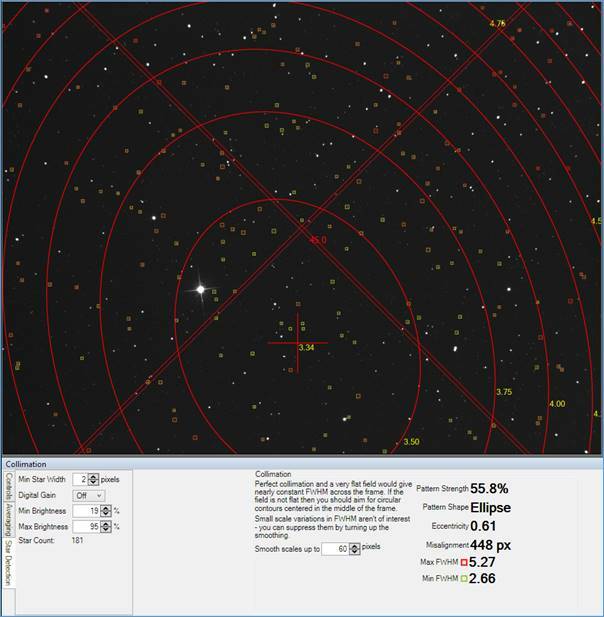 When the collimation tool is activated, SharpCap will detect and measure the sizes of stars across the frame and highlight each detected star. SharpCap will also try to find a pattern in the sizes of stars across the frame and draw a contour plot of star sizes over the image. Small, well-focussed stars will be highlighted in green to yellow colours, larger, less well-focussed stars in orange to red colours. In the example above you can see that there is indeed an area with smaller stars surrounded by regions with less well-defined stars, but that centre of the pattern is just below the centre of the frame and is slightly elliptical rather than circular. This offset indicates that the collimation is not quite correct. Offsets of the pattern from the centre are largely caused by incorrect collimation of the primary mirror. Elliptical patterns (ie non-circular) are largely caused by incorrect secondary collimation or camera tilt. A circular (or very nearly circular) pattern centred in the middle of the frame represents good collimation. The normal Star Detection and other controls are available to the left-hand side – these are described in detail in the documentation on the Focus Tools Controls. The collimation tool additionally offers the ability to ignore star size variation on small spatial scales across the frame – sometimes this can help bring out the pattern of star size variation on the larger scale. · Pattern Strength – this is an indication of how much of the variation in star size is explained by the pattern. High strength patterns are more reliable than low strength patterns. · Eccentricity – this shows how far from circular an elliptical pattern is. An eccentricity of zero means circular. Note: using a coma corrector dramatically reduces the coma of stars away from the centre of the field of view. While this improves images dramatically, it also makes it very hard or impossible for this tool to make accurate readings of collimation.